A lot of buzz has surrounded lately a not so new, grapevines' disease called "ESCA". Credible wine writers have dealt with the issue like Jancis Robinson and Andrew Jefford. Indeed, Robinson had the guts last year to write about this ''new'' in terms of dimensions disease even in Financial Times. Α couple of months ago in a news briefing citing the view of Dr. Richard Smart, one of the leading viticultural experts, it was stated that vine trunk diseases may well eventually have a greater impact on wine production than phylloxera. Smart further argued that although ESCA is more widespread than devastating phylloxera, currently there is no way to control it, while there is for phylloxera. But what do we know so far about ESCA? Just a few, firstly that it affects more old vines of at least 10 years of age and that it has spread to Spain, Burgundy and Australia among other countries and regions. In Burgundy, producer Denis Bechelet noted that around 10-20% of his vines annually fall victim of ESCA while in Gevrey Chambertin Premier Cru Gazetiers a significant amount of Rousseau's vines of 50 years old die as well. Yet according to Smart, you can now trace ESCA even in younger vines arguing that ESCA is a worldwide issue and nurseries around the world supply plants affected with trunk diseases. Right after our visit to Epirus-Metsovo where we encountered Traminer vines affected with ESCA as shown above, we began to wonder what is going on with ESCA in Greece. Professor of Agronomy at the Aristotle University of Thessaloniki, Dr. Stefanos Koundouras informed us that '' ESCA is a disease that slowly destroys the vascular system of the vine, causing plants to die within the next 3 to 5 years. The first symptoms appear on the lower leaves and gradually extend to the whole plant through chlorosis of the leaves around the main nerves. The situation is starting to becomes serious and in Greece''. To put it simply, ESCA is a hard enigma to solve. 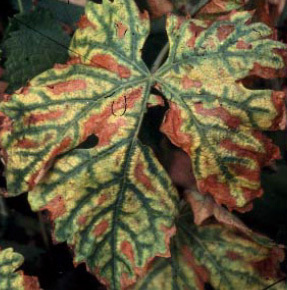 A viticultural-consultant and owner of the family winery Argatia in Naoussa, Dr. Haroula Spinthiropoulou comments that ''these fungi mainly appear in vineyards of more than 4 years old and in recent years phytopathologists argue for ESCA affecting younger vineyards as well, mainly due to reproductive material that induces different fungi, resulting in drying out of young vines age 1-2 years. 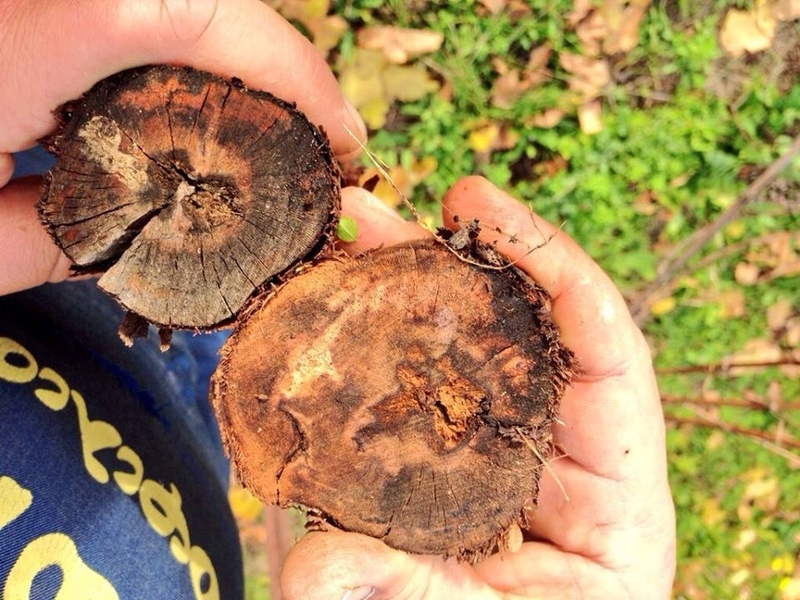 In most locations within Greece, especially in vineyards over 10 years old, ESCA and eutypa dieback (another important trunk disease) are present with their rate increasing with the age of the vineyard. Red alarm buzz and for the agronomist and nursery owner Costas Bakasietas stating that ''the situation is very serious in Greece. In cases where the spread of disease is higher due to the sensitivity of varieties such as Roditis or Agiorgitiko, the results are devastating. Wine producers are also greatly to blame as in their vast majority they do not take the precautionary measures necessary to prevent ESCA". Coming to the question whether wine producers have realized the magnitude of the issue Spinthiropoulou replied, ''Vine growers although they see sick vines in the vineyards, do not give them adequate attention, thus contributing to the spread of disease. The main way of disease transmission is by pruning scissors, while the likelihood of infection is greater within larger cuts, especially when they are not immediately covered with a fungicide, since the the pathogen enters through this pruning sections". ''It goes without saying that nurseries are also to blame for the drastic expansion of ESCA or its dissemination. Nurseries, must consult special agronomists, who continuously monitor the mother plants from which they receive the plant material, whether those are rootstocks or grafting material as even the former could also be affected. In addition, it is necessary to create healthy and certified mother vine plantations of the Greek grape varieties. Such will reduce rapidly and by more than 98% the problems of ESCA at least with regard to younger vineyards''. Moreover, Spinthiropoulou emphasizes the high vine density as one of the reasons why growers do not pay the adequate attention. ''Vine growers believe that if a plant is damaged, it can be replaced by the adjacent one. But most are ignorant of the fact that the first ill stump hides the risk for others, an almost imminent danger of the necessary measures are not taken''. Is there a way to fight ESCA? As aforementioned, currently no cure exists. Thus, the effects of ESCA can be limited by the use of a combination of methods. First nurseries need to properly perform their services by offering healthy material. Secondly wine producers themselves shall be proactive when cultivating and pruning the vines. As an example, in the market special scissors exist that can simultaneously spray both the blade and the intersection of pruning so as to limit the spread of ESCA. For Smart, within the next ten years a cure will be found as growers in Barossa have already made some progress in this regard. However, the cure will be far more complicated than grafting into American rootstocks as in the case of phylloxera.